Both bands revolve around the 50's to 80's Rock and Roll era. We do Private and Corporate functions, Club Functions, Weddings, Birthdays, Divorces, B&S Balls, Hoe Downs etc. In fact anywhere you need Rock and Roll we will be there. 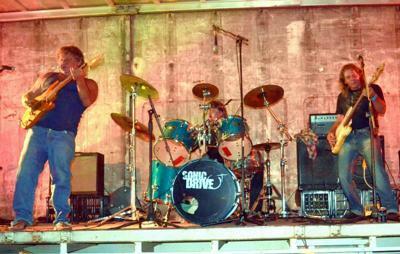 We play throughout Darwin and all rural communities. Price is negotiable depending on size and location of venue. With us you deal direct with the Band Leaders. There is NO Agent or hidden costs, once you have been quoted a price, this price will include GST and any travelling costs associated with getting the asked for Band to your venue. Both these bands, Arthritis Bros, a 3 or 4pce and Pot-Belly Rock, a 5pce, feature all Live Performers thus NO Backing Tapes or Glorified Kareoke. Available for 2012 including New Years Eve. Both these Bands also travel and enjoy playing to all Cultures and Creeds. The" arthritis brothers" is an amazing rock band. I have been following them for several years. Sadly they have not got the kind of recognition they deserve. Believe me! This is one of those bands that can take you back to the 90s. R I P Russell-I'll always remember my short time with the Arthtitis Brothers. So sad to see another group of good entertainers go south. If only they all knew. We currently dont have any CD's or Video's left but are looking for a good Promoter to start the making and distribution of more and new ones. If your a fisherman Davo, we reckon you'll get a kick out of one of our new one's "Lawn Mowin' Man". It's on the Album "Livin' In The Territory". We've just got to get it out there now. Thanks again for all the great support we're receiving from the Top-Enders. Where can I buy your CD or video; I want one. The full 8 mins of the AB are now on Youtube, go to Arthritis Brothers Aus Got Talent 2012. Cheers and Rock n Roll. There's plenty of good bands down south mate but none of 'em has your wit and humour. Bore it up 'em mate. When you gunna do nutha album? We got your first one. We would like to thank Russ and the Arthritis Brothers for the great shows and we all wish you guys the very best. Dont forget where home is. We think we've worked it out. If you go to the Doctor, you pay a certain amount... if you go to the Specialist you should and do pay more. While our Pubs/Clubs here charge exhorbitant prices for drinks, they dont want to pay appropriately for our Specialist or Favourite Bands. While there are plenty of Doctor's here, all our Specialists go South to get the pay they deserve. In wishing the Arthritis Brothers and others of their ilk the best, we settle in to the same old same old of Darwin being once again left with the S.O.S. How about you venue's start LISTENING to US, the locals that you rely on. Hi Russell aka The Bandit. I watched you many years ago as a budding drummer in the "Chase" and "Midnight Special" days. Now I see and hear of you as one of our great aussie guitarists. You should be very proud of your achievements mate. I wish you and your band the very best. Hurry back guys. Bugger them Southerners poaching our talent. To the AB and PBR Bands. Thank you for the great times you both have given us. We all love our rock and roll and we all love our comedy, you guys have combined the two to give us, the punters,(as you have affectionately named us)great memories of many parties, nights and piss-ups. 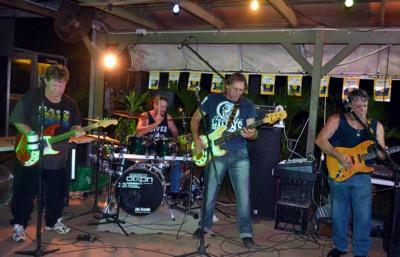 In just over 40yrs, I cant remember any better ambassadores of Darwin Bands than you guys. We wish you all the best and hurry back. June Coulter and Members of the Jive Rock and Roll and Top-End Music Lovers Clubs. Rito punter's, to all of you from Darwin to the rest of Aus, the Arthritis Brothers and Pot-Belly Rock Bands are closing down and members moving on to other crazy things in life. Let us take this opportunity to personally thank all of you (the audiences) who've attended our shows over the past years and also to thank you all for elevating us up the ranks. We are all "good muso's" but we would never have achieved what we have without YOU so goodbye, best wishes and "Beware as one day we may return". The AB Band and PBR Band. My husband and I are, so we thought strictly Country Music fans but we will admit the Arthritis Brothers are a great rock and roll conversion kit. Great night guys. My goodness, how fast is that drummer? When are you boy's coming to Zeehan ( Tassie )? We seen you at Dundee Lodge Resort, thanks for the great nights entertainment. Arthritis Bros, you guys are absolutely awesome. We were at the Noony Rodeo on saturday night when you guys played. Can someone get the tavern to do something about extending their license ? You guys were on for too short a time. Arthritis Brothers - saw you guys at the Noony Rodeo on saturday 28th, you guys are awesome. The organisers of the noony shows need to lift their game a bit though, we want you on stage for a lot longer than you were. If Rock and Roll is King then you guys are Royalty. Love that crazy guitarist of yours. The Arthritis Brothers would like to personally thank all the punters that written in with comments to this site, even the bloke who rekons we should be retired, we'll learn a couple of Doof-Doofs just for you mate. To Louise Cooke, the answer is yes, we performed at Australia's Got Talent in Perth in Febuary. We got 3 green ticks from the judges so hopefully we'll go on to the next auditions in Melbourne. Once again thank you all for the great comments you'se have put in for us and remember if your at our shows, come up, have a beer, talk to us and hit us up for any requests as we are there for YOU. My wife and I are avid Band Go-ers and whilst having seen some great acts, the Arthritis Bros willingness to have their audience's participate puts them a cut above. Great show. 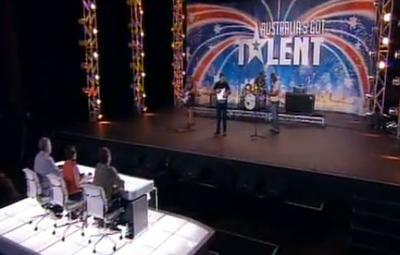 Are you the same guys that performed in Perth recently at the 2012 auditions for "Aus Got Talent?" If Pot-Belly Rock are equal to the Arthritis Brothers with performance(s) then WHERE and WHEN are they playing next? We want to be there. You guys are probably a bit long in the tooth for Australian Idol but why cant we see a band like you'se on shows such as Australia's Got Talent? You'll get our vote. The comedy of Rock n Roll doesn't come any better than this. Your Bass Player is a brilliant Musician and the perfect straight-man for that crazy guy on vocals/guitar. Great Drummer as well. To the arthritis brothers,your great live muso's and even greater at crazy on-stage antics. Had a ball at your performance. Why cant we see more of bands like this. Is it because the pubs would rather pay those cheap karaoke groups? these are the kind of bands that we (the public) love to rock to. Awesome guys. Great to see and hear the Rock Classics played live. Dont stop. Go the live ammo, No Midi here. I have seen both these bands in action and they are simply awesome!!! Both bands use live musicians playing what you see with no pre recorded backing music. GO lIVE ROCK n ROLL!!!! Hopefully this means that you guys are going to learn modern day and alternative music as Old Rock and Roll is DEAD. Move with the times boys, the younger generation is where the money is.